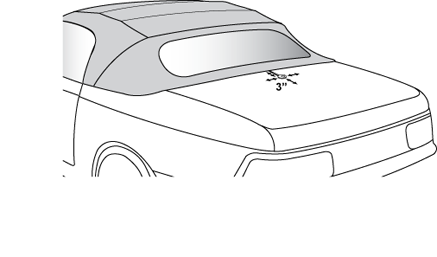 ✓DO: Mount the SIRIUS Magnetic Mount Antenna on the trunk lid at the front edge, or on the vehicle hood. 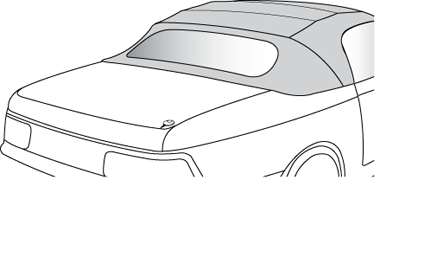 ✓DO: Mount the antenna on the trunk lid or hood where it has a clear view of the sky in all directions. 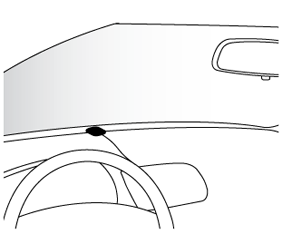 ✓DO: Mount the antenna on the trunk lid where it has at least 3 inches of clear space around it. ✓DO: Use the supplied rubber tail/cover to protect the antenna cable. ✗DO NOT: Don't mount the antenna inside the vehicle, for example, on the dashboard. 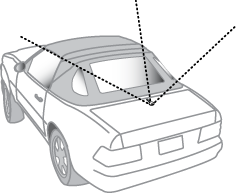 ✗DO NOT: Don't mount the antenna on any of the vehicle's front, back or side pillars. ✗DO NOT: Don't mount the antenna closer than 3 inches from the edge of the hood lid or trunk lid. Use the supplied rubber tail/cover as a guide for judging proper length and correct positioning. 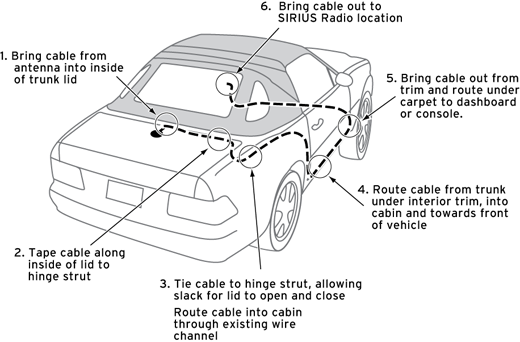 Here's how to route the antenna cable from the SIRIUS Magnetic Mount Antenna to your SIRIUS Radio in a convertible from the trunk lid. See the detailed explanations below the main illustration. You can also view the detailed break-out illustrations for each major step by clicking on the link that is highlighted in blue in each section. 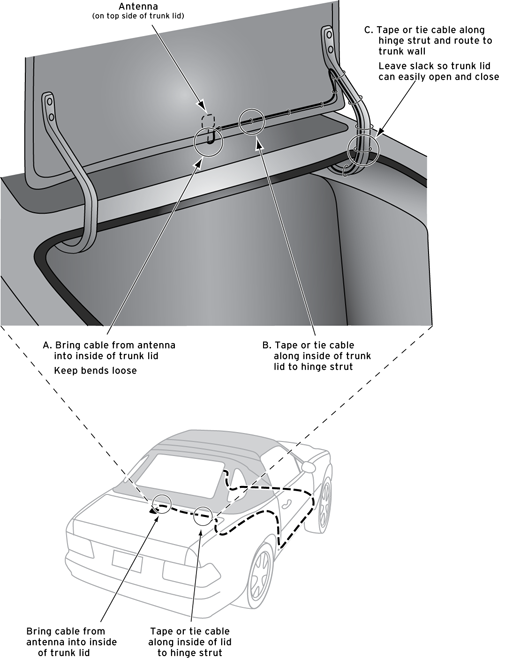 Bring the antenna cable into the trunk at the front edge of the trunk lid. Keep any bends in the cable loose. 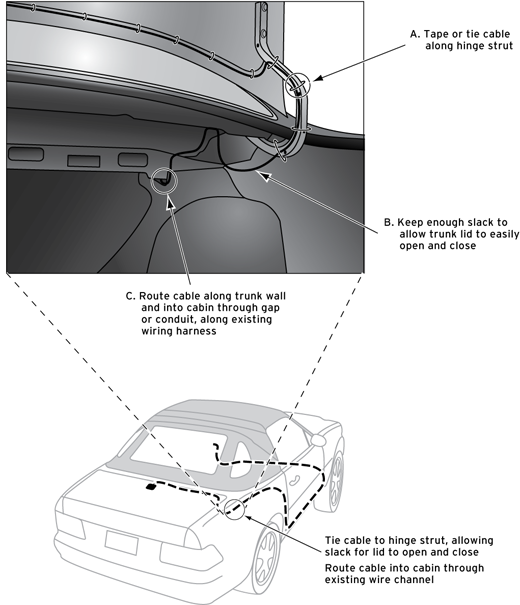 Tape or tie the cable along the inside of the trunk lid to the trunk lid hinge strut. Allow enough slack in the cable so the trunk lid can easily open and close and keep the cable away from hinges, gears, etc. that could crimp or cut it. 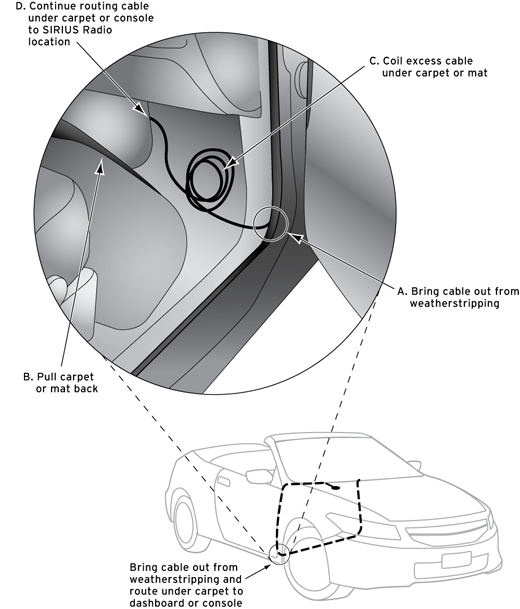 Route the cable along the trunk wall and into the cabin through a conduit or along an existing wiring harness. 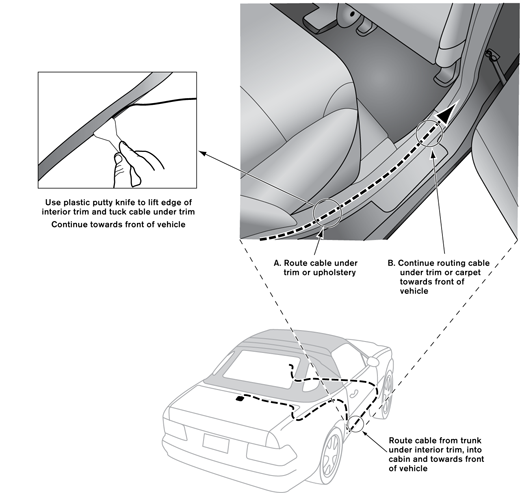 Route the cable through the main cabin area under the interior trim, towards the front of the vehicle. Use a plastic putty knife to lift the plastic trim just enough to tuck the cable underneath. Avoid any airbag locations. (Airbag locations are marked with "SRS" logos.) Be careful not to crimp or cut the cable. Bring the cable out from under the trim near the dashboard and route it under the carpet toward the dashboard or console. Coil any excess cable in a hidden location, such as under the carpet, keeping it away from any vehicle pedals or controls. Secure the excess cable with wire ties. Bring the end of the cable out at the XM Radio location. Leave yourself enough cable so you can easily connect it to the antenna connector (sometimes marked ANT, ANT IN, or ANTENNA) of the XM Radio or Vehicle Dock. 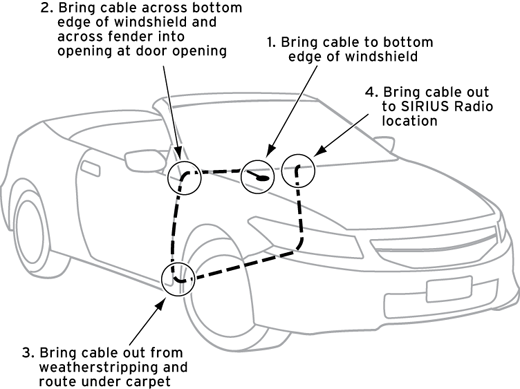 Routing the Antenna Cable from the Hood Here's how to route the antenna cable from the SIRIUS Magnetic Mount Antenna to your SIRIUS Radio in a convertible from the hood lid. See the detailed explanations below the main illustration. You can also view the detailed break-out illustrations for each major step by clicking on the link that is highlighted in blue in each section. Bring the cable to the bottom edge of the windshield. 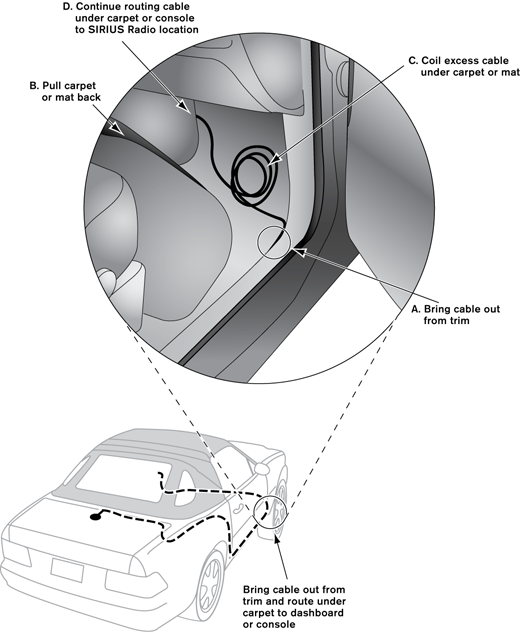 Bring the cable across the bottom of the windshield, to the fender, and across to the door opening. Lift the weather stripping from the opening and tuck the cable inside it. Then replace the weather stripping. Run the cable inside of the weather stripping to the bottom of the door opening. 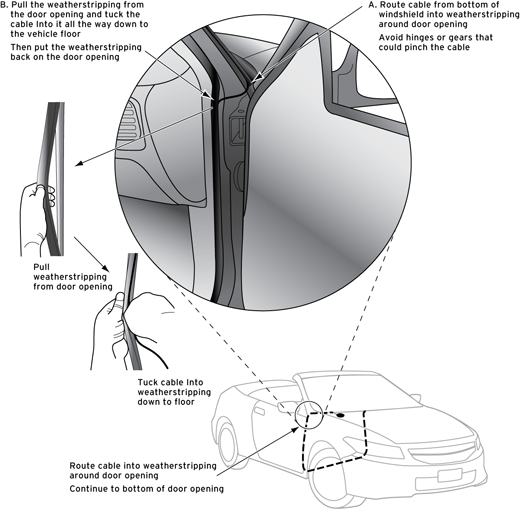 Pull the cable out of the weather stripping at the bottom of the door opening and route it under the carpet toward the dashboard. Coil any excess cable in a hidden location, such as under the carpet, keeping it away from any vehicle pedals or controls. Secure the excess cable with wire ties. Bring the end of the cable out near your XM Radio location. Leave yourself enough cable so you can easily connect it to the antenna connector (sometimes marked ANT, ANT IN, or ANTENNA) of the XM Radio or Vehicle Dock. PROBLEM: SIRIUS RADIO DISPLAYS "ANTENNA NOT DETECTED"
Possible cause #1: The antenna is not properly connected to the Radio or Vehicle Dock, or the connection has become loose. Solution: Check the antenna connection to the SIRIUS Radio or Vehicle Dock and make sure it has a good, snug fit. 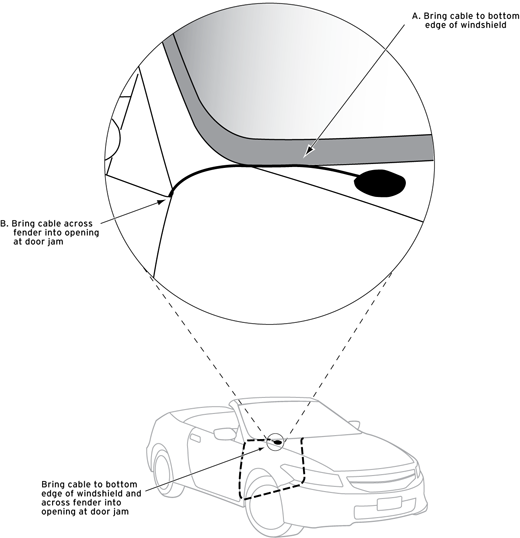 Possible cause #2: If the antenna is properly connected to the SIRIUS Radio or Vehicle Dock, there may be a break in the antenna cable, or a problem with the antenna. Solution: Replace the Magnetic Mount Antenna. PROBLEM: SIRIUS RADIO DISPLAYS "ACQUIRING SIGNAL"
Possible cause: The Magnetic Mount Antenna is not receiving a satellite signal. Solution 1: Make sure the vehicle is outdoors with a clear view of the sky. Solution 3: Move the vehicle away from any obstructed area. For example, if you are parked in an underground garage, you should receive a signal after leaving the garage. Note: Signal reception can also be hindered if your vehicle is in a covered garage or parking structure, or you drive under structures or obstacles such as bridges, overpasses, or trees with a lot of foliage for a prolonged period. Possible cause #1: If you have connected the audio of your SIRIUS Radio to your vehicle's FM radio using the FM transmitter, the FM channel you have selected is most likely being used by an FM radio station. This interferes with the audio of the SIRIUS Radio. 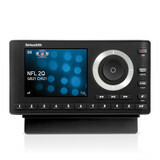 • Use the SiriusXM FM Channel Finder at www.siriusxm.com/fmchannel. Go to the website and enter your zip code. The Channel Finder will suggest a list of available FM channels in your area. For convenience, write down or print out the list. • Manually tune through your local FM channels on your vehicle's FM radio. Locate and create a list of channels that aren't being used by any FM radio station. Write down the list. 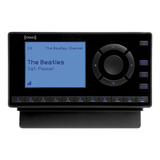 Once you have created your list of available FM channels, you will need to find the one that provides the best match for your SIRIUS Radio. TIP! You'll need to use the 'Manual' tune function on your vehicle's FM radio to tune through every FM channel one-by-one. Turn on your vehicle's FM radio. Start at 88.1 and use the 'Manual' tune function on your vehicle's FM radio to tune through each FM channel one-by-one (88.1 followed by 88.3 etc.) to locate channels that aren't being used by a local FM radio station. Write down each FM channel that has only static or silence on it, until you reach 107.9, which is the highest FM channel on the vehicle FM radio. Pick the first FM channel from your list. Turn on your vehicle's FM radio (if you have not already done so) and tune it to this FM channel. 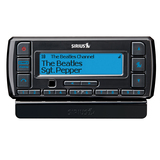 Turn on your SIRIUS Radio and then set it to transmit on the same FM channel as your vehicle's FM radio. Refer to your SIRIUS Radio User Guide for detailed instructions on how to do this. 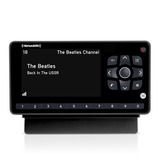 You can find SIRIUS Radio User Guides and Quick Start Guides here. Possible cause #2: If you have connected the audio of your SIRIUS Radio directly to your vehicle's stereo system using the AUX or AUX IN, or LINE IN jack, the Aux In Cable may not be properly connected. Solution: Make sure the Aux In Cable is properly connected; one end to the AUX or AUX IN, or LINE IN jack on your vehicle's stereo system, and the other end to the AUDIO, AUDIO OUT or LINE OUT connector on your SIRIUS Radio or Vehicle Dock. Possible cause #3: If you have connected the audio of your SIRIUS Radio directly to your vehicle's stereo system using the AUX or AUX IN, or LINE IN jack, you may not have selected the proper input source on your vehicle's stereo system. Solution: Set your vehicle's stereo system to play input from the auxiliary input source.